Despite many years of living in the US and despite some travel to Mexico, Peru, Brazil, and Argentina, I confess that I know very little of Central and South American cuisine and drinks. 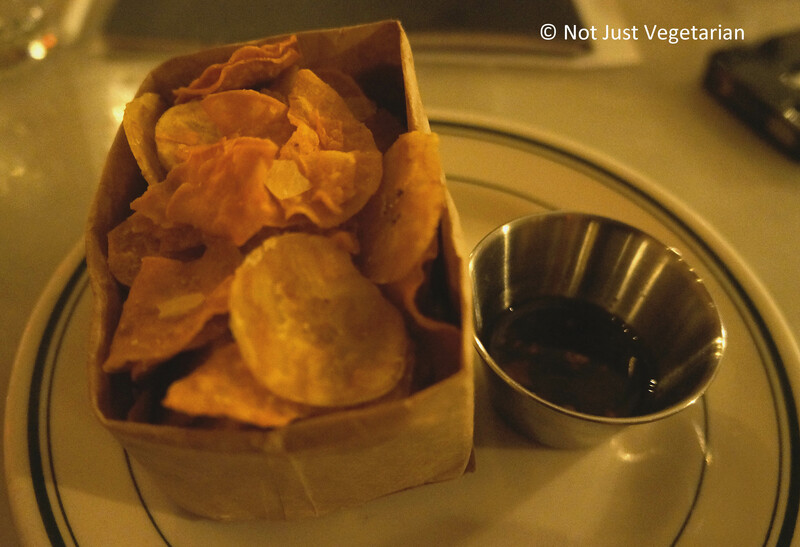 A good reason, I think, is because I do not get to eat them often in NYC (excluding Mexican of course), and when I do, they are not often worth going back to (as you will know from this post of mine). 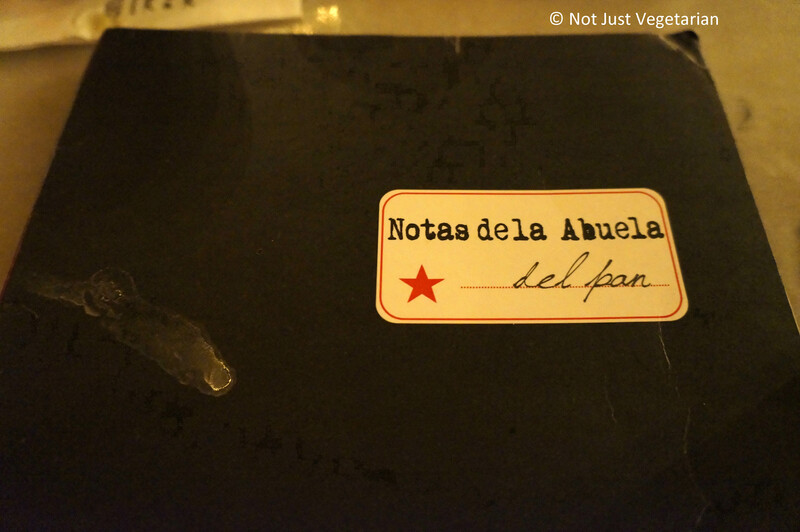 When I received the invitation for a press dinner at Oficina Latina NYC, I was disappointed that I was not aware of its existence for the past 2.5 years that it has been open, but was delighted that I got to go by invitation. What a pleasant surprise it was for me to discover (or rather to be introduced to) Oficina Latina NYC!! 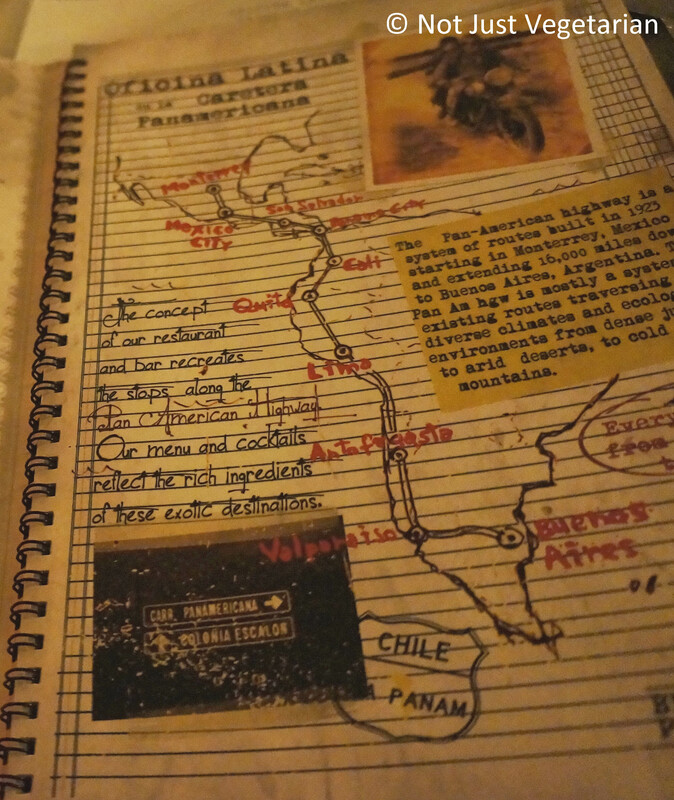 At Oficina Latina NYC the decor takes one back to stops along the Pan American Highway of the 1950s and the dishes reflect the rich ingredients of exotic stops along the highway. Oficina Latina was started in October 2010 by Max Busato and Paolo Votano. Max Busato has designed the interiors of Oficina Latina NYC with a lot of thought and care – the furniture and the fittings are either vintage or custom-made. 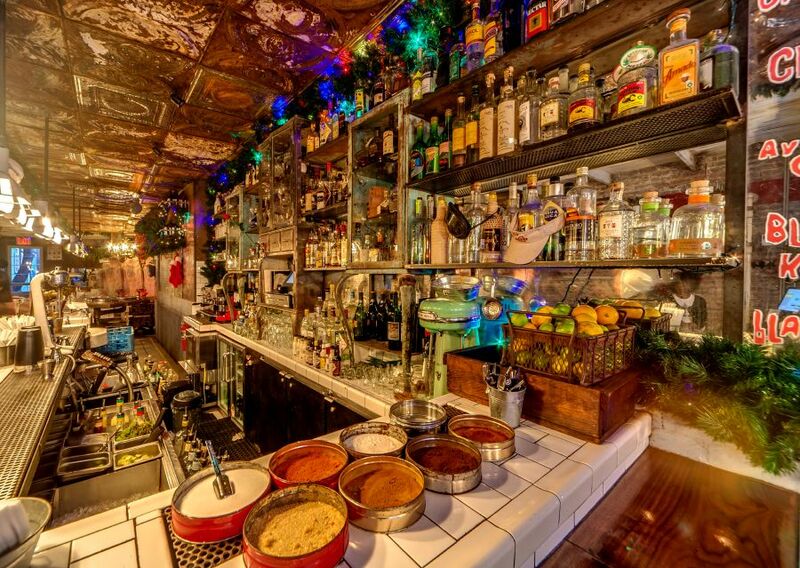 The floors are from reclaimed wood, the tin ceiling is from a 1920s Bank in South America. The “trouble lights” are from a mechanic’s garage. The bar has vintage barber chairs and bar stools. 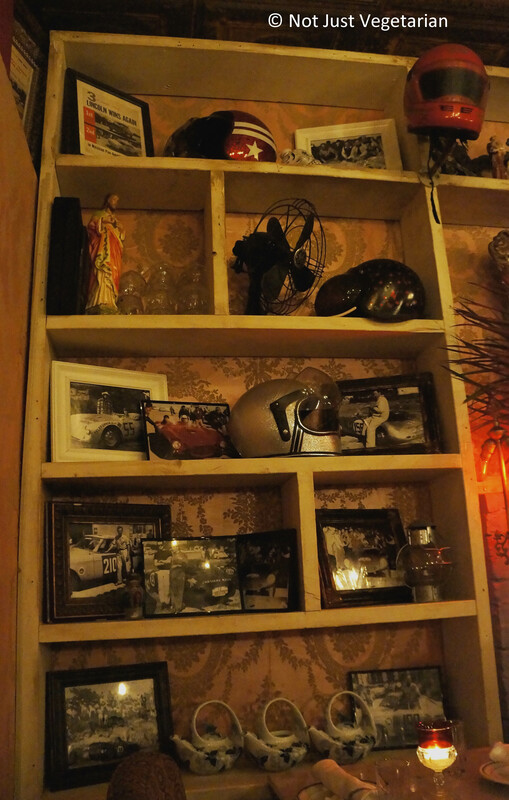 On the wall are photos of drivers and race cars from the Pan American highway of the 1950s. The L shaped bar serves the complete lunch and dinner menu. The floor-to-ceiling antique metal doors open out to the street in good weather. There is also a party room downstairs for a private event, although I did not take a look at it. 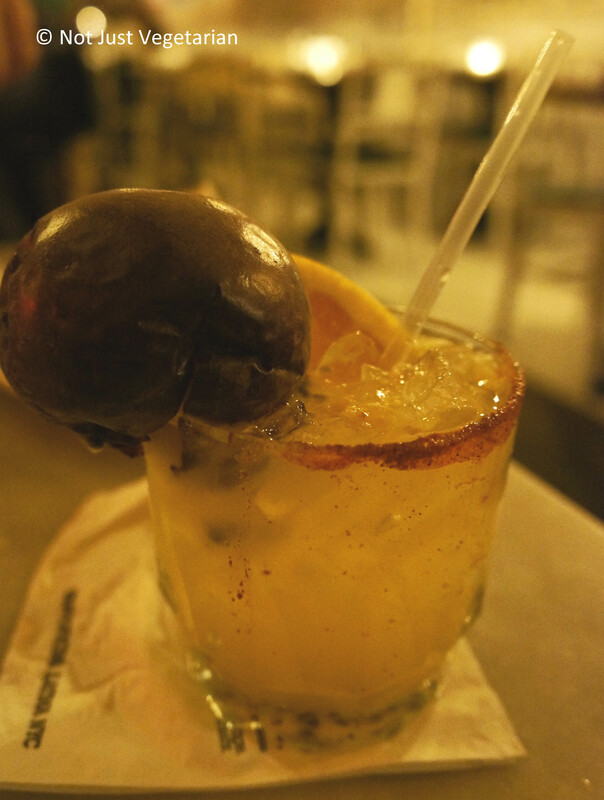 Paolo Votano, the Beverage Director at Oficina Latina NYC, has stocked the bar with 100s of mezcals, and tequilas, many varieties of piscos, and a South American wine list. 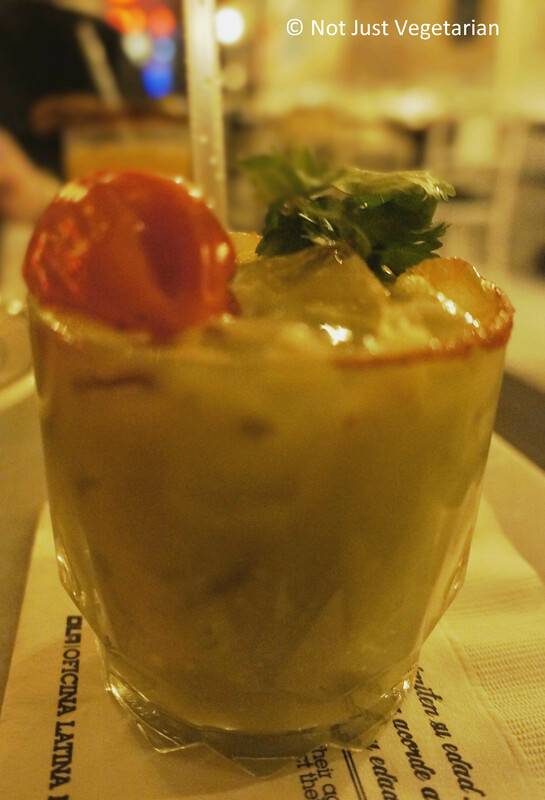 Paolo is very hands-on and often creates exotic tropical fruit infused spicy cocktails effortlessly. 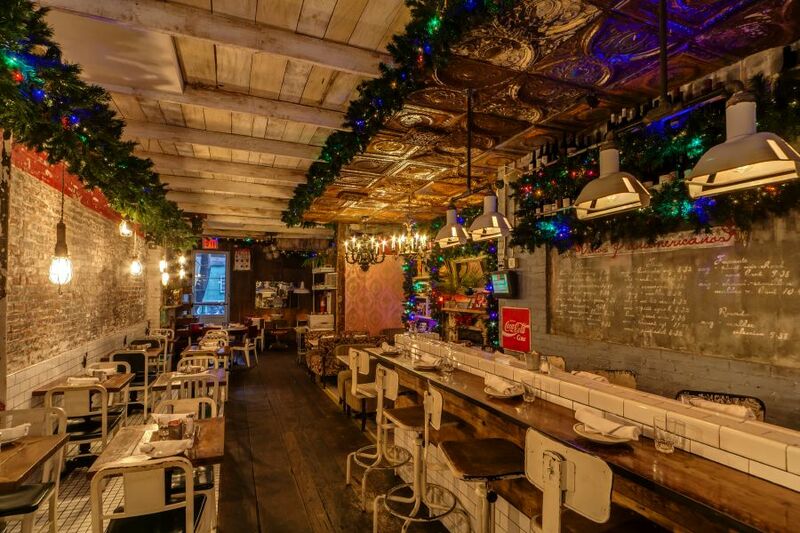 Oficina Latina NYC serves brunch every day (yes, that is not common in NYC, isn’t it? ), and is open late until 1 AM every night. The brunch with a standard cocktail offers good value at 15$ per person inclusive of a standard cocktail (sorry, Paolo’s exotic concoctions are not “standard” cocktails and are therefore not included). Happy hour is from 4 to 7 PM every week day (2 for 1 on select South American wines and classic Latin-inspired cocktails). Chef Abraham Trinidad’s cooking is simply delicious, to say the least. Oficina Latina’s lunch and dinner menu is being organized differently to include tapas, small plates (seems to be the trend in NYC these days, isn’t it? ), tacos / tortas, arepas, ensaladas (salads), paella and with daily specials. The menu card has been made to look like it is from a vintage cafe / restaurant along a highway with its food and wine stained look. The typewriter style font of the menu takes one back to the days before a computer generated font decorated a menu. I am hoping that the newly designed menu will appear on a vintage looking menu card that is easier on the eye under “trouble” light. The music played at Oficina Latina NYC ranged from Latin Jazz to smooth Jazz and made for a very enjoyable, relaxing evening. We were served the tasting menu that comprised grilled octopus as a starter, suckling pig tacos, blood sausage with arepitas, a roasted half chicken, and a spicy caramelized pineapple served with a coconut sorbet for dessert, along with multiple tropical fruit infused spicy cocktails. 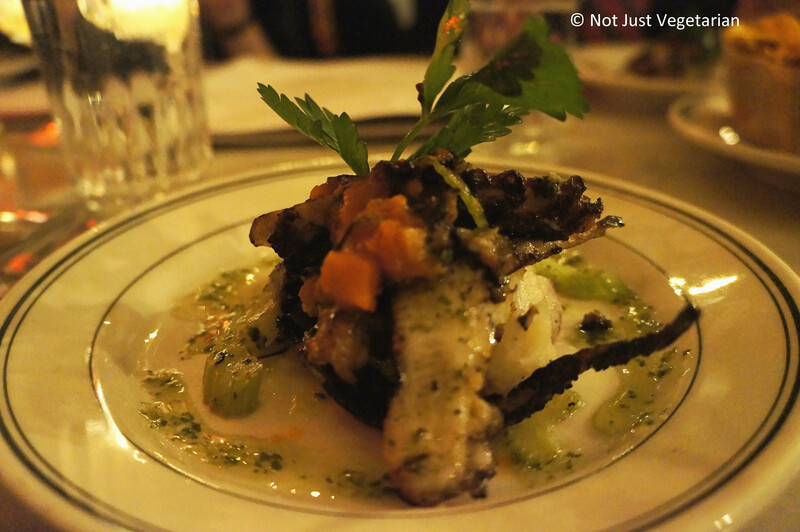 The grilled octopus appetizer is among the best that I have had in NYC. Char-grilled, smoky and extremely well cooked in a cilantro sauce. The diced potato and celery along with the tomato salsa offered a wonderful contrast in texture. This is my favorite dish of the evening. The suckling pig tacos were served next. I loved the tacos for being so light and fresh. 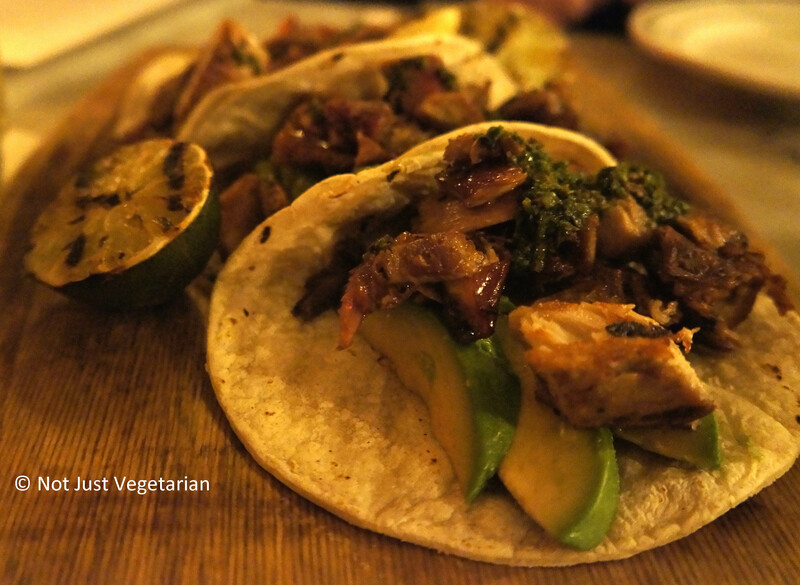 The avocado and the chimichurri sauce on the tacos were simply amazing. It was my first time eating suckling pig, so any description of the dish by me would most likely not do justice to it, so I will write no further about the suckling pig. My fellow diners were very impressed with the suckling pig in the tacos. In most other restaurants that serve suckling pig, it is served as an entrée or a main course, and so it will be at Oficina Latina as well, but as a daily special (obviously, only on the days that it can be featured as a “daily special”, else it would not be a “daily” special, would it?). I loved the way the tacos were presented on a wooden slab instead of a regular plate, making for a rustic, and freshly grilled look consistent with the taste. The dish served next was the blood sausage. 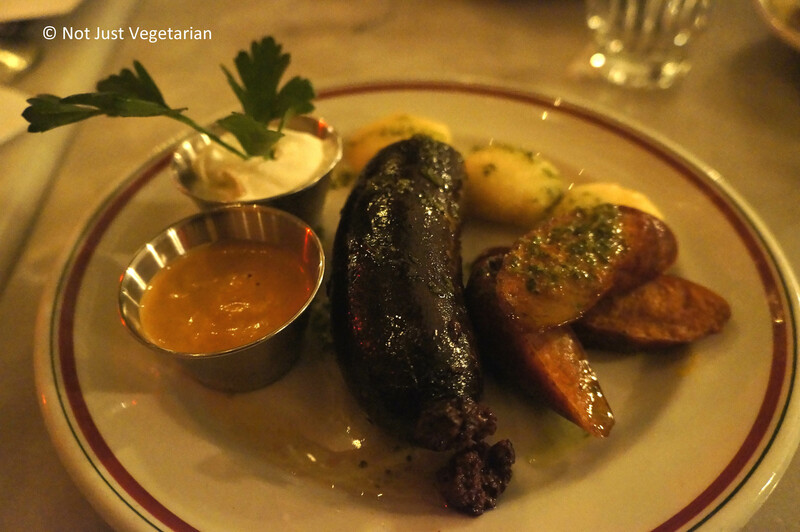 This was my first time eating a blood sausage, and so, I will write about the parts of this dish that I can relate to. The blood sausage was served with arepitas (small arepas), some sliced chorizo, crema fresca (fresh cream), and a chipotle mayo for dipping. The arepitas were sweet, crispy on the outside and soft inside just the way they ought to be. They were absolutely divine with the not-too-spicy chipotle mayo and the fresh cream. If you have read any of my previous posts, you will know that chorizo is an all-time favorite of mine, and this chorizo certainly did not let me down. I would order this dish again if it was just served as chorizos and arepitas, or just as the arepitas with the fresh cream and chipotle mayo. The roasted half chicken arrived as the next course. This was a deboned chicken, roasted and served with cilantro potatoes and a garlic serrano sauce. I know what you are thinking, why would someone order chicken when there are so many meat options? To me, it’s an excellent choice of lean protein (of course, it’s not lean if it’s served with its skin, but all-the-same). This was my second favorite dish of the evening (yes, the octopus appetizer is still my favorite) because the chicken was not just juicy and flavorful by itself, but was also perfect with the accompanying garlic sauce, which did not overwhelm the palate with its garlic-ky smell or the spiciness of the serrano chilies. The cilantro potatoes were absolutely delicious!! They were whole potatoes, salted, roasted / charred , and sprinkled with cilantro all around. 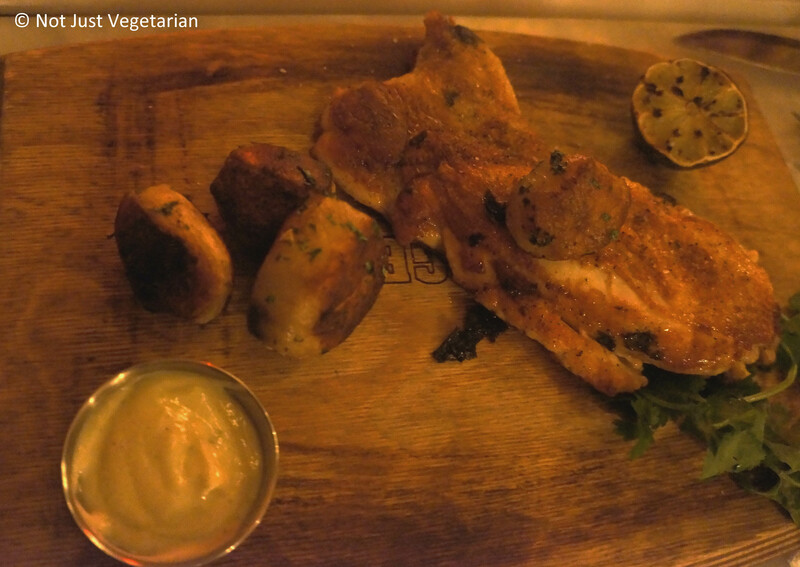 As you can see, the chicken was presented on a wooden slab giving a rustic feel to the dish. 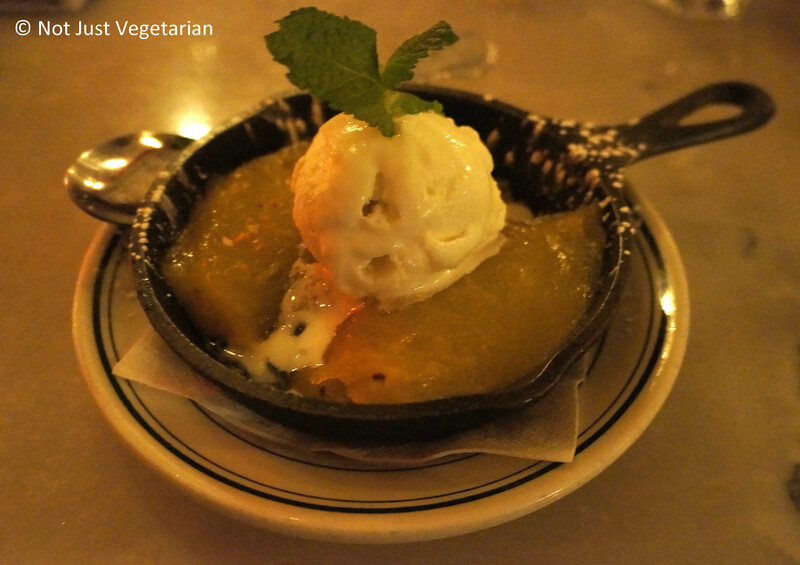 Dessert was chili caramelized pineapple slices served with a coconut sorbet. This was a very light dessert with a tropical feel – how can it not feel so with the pineapple slices and the coconut sorbet? I loved this dessert. The pineapple slices were sweet, but not cloyingly so because of the chili in it, although I could hardly taste the chili. I love desserts like that – where salt or chili adds a layer of complexity to the sweetness. The coconut sorbet felt very fresh, in fact, I could almost taste the grated coconut in the sorbet. The above dessert was to have been paired with a shot of “Passion and Love”. We were served the shot once we were done with the dessert, not sure why, and not that it matters any more. I have had dessert wine, or grappa after dessert, but a shot of rum after dessert was another first for me that night. 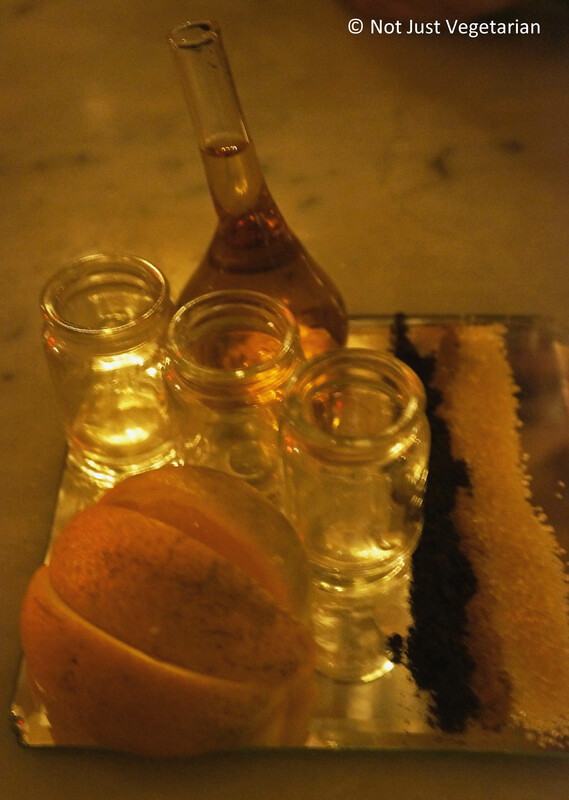 “Passion and Love” was a shot of Venezuelan rum, served with (navel?) orange wedges that were to be dipped on to a tri-color streak of coffee powder, cinnamon powder and raw brown sugar crystals. I have never had a shot of rum before (another first! ), but after this shot of super-smooth rum combined with the acidity of the fresh orange, and the sweetness of the sugar, and the flavors of coffee and cinnamon, I am a convert! Cilantro avocado margarita: I was keen to try this cocktail as soon as I entered. The avocado in this drink added some density which I did not particularly care for. I would have enjoyed this drink more if it had some (or more) acidity and some salt. The gorgeous looking chili in the picture of the cocktail packs quite a punch I was forewarned by the server who brought me the drink, and I decided to stay away from the chili. Why would you go to Oficina Latina? 24 Prince Street (Between Mott Street and Elizabeth Street), New York, NY 10012.